A confession: I am a brownies snob. I know I am far from being the best baker in the world, but still, I am proud about being able to make a good batch of mean, delicious, and sometimes sinful brownies. I even sold them to officemates once upon a time. 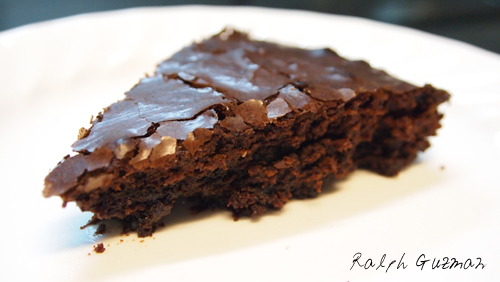 I am vocal when it comes to brownies, and the critic in me comes out when restaurants serve dry, tasteless versions. And then, I also generally scoff at grocery-bought brownie mixes. Take note, I don’t scoff at people who use them. I scoff at the idea of me using them because, modesty aside, I’d like to believe I have decent skills in baking. Simultaneously, I feel that brownie mixes don’t taste as good as the ones you can make from scratch. But recently, I encountered this at the grocery. 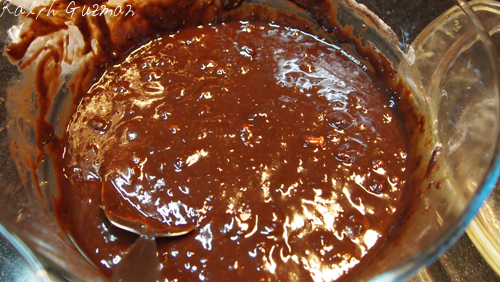 Ghirardelli’s Walnut Brownie Mix! I just had to buy it and make a review. I bought it for about P200, and I got it to see for myself if it will live up to the reputation of the brand. 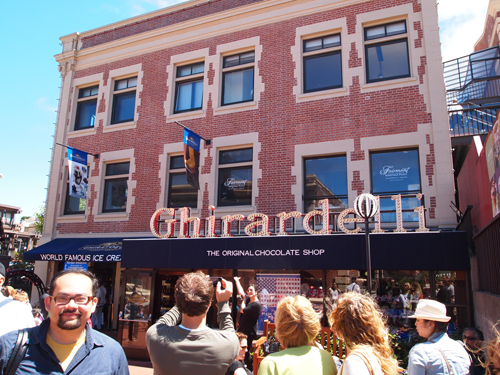 Ghirardelli, of course, is a brand known worldwide for its quality. It also happens to be a sister company of Lindt. They have been around since the 19th century, and their complex in San Francisco is a shrine for chocolate lovers everywhere. I was very fortunate to go there on a “pilgrimage” last year, which was a lot of fun. Yours truly at Ghirardelli in San Francisco. I was also able to visit their cafe in Chicago. It was a smaller place, but the food was just as sweet and delicious. Anyway, going back to the brownies. Once you open the box, everything is almost set. 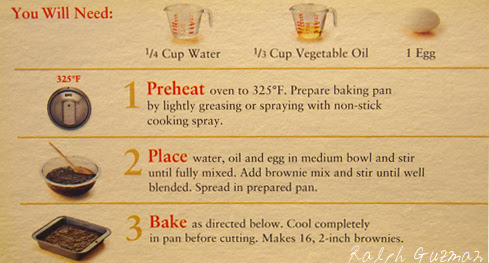 You will just need to add a few, very basic ingredients: water, vegetable oil, and 1 egg. The instructions are very simple, and you won’t need any special equipment. I followed the instructions — just put everything together. The only deviation I did was to use a round pyrex as I wanted cake slices instead of squares. Less than 15 minutes later, here’s how it turned out. The verdict: it was very delicious. 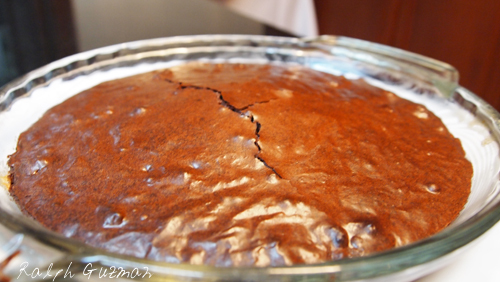 The brownies came out very soft and moist, and the rich, delicious chocolate taste was very evident. My only wish is for more walnuts, as I prefer my brownies to be chunky (well, they did package this as a walnut brownie mix, after all). So next time I make this, I’ll just have to add more walnuts or even pecans. Other than that, everyone was happy with the brownies. I served it during a get together with relatives and it was a hit. It even tasted better when we ate it ala mode. You can definitely serve this and your audience would not know that you baked from the box. I also see this product as practical when you have sudden visitors at home and you need to feed them something. 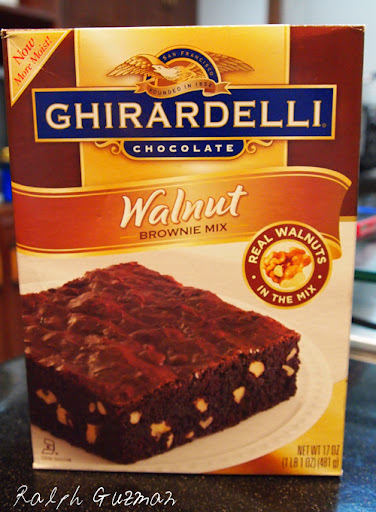 Ghirardelli’s Walnut Brownie Mix is brownies for dummies. It’s easy to make and is practical. But don’t get me wrong about the dummies part. In hindsight, you won’t be a dummy if you decide to buy it. For the time-pressed, quality-conscious baker, you’ll be a dummy if you DON’T get it. 🙂 Happy baking! 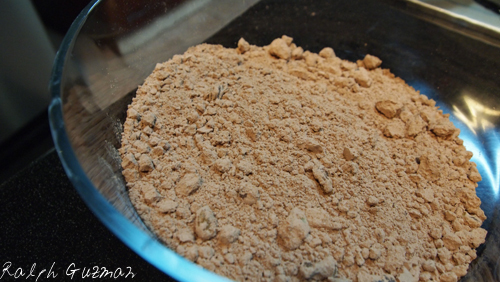 This entry was posted in Products & Services, Rated by Ralph and tagged Brownie Mix Ghirardelli, Brownie Mix Reviews, Brownies for Dummies, Ghirardelli Brownie Mix, Ghirardelli Brownie Mix Review, Ghirardelli's Brownie Mix, ralph guzman, RatedRalph.com by Ralph. Bookmark the permalink. Next → Next post: IHOP Manila is Now Open!